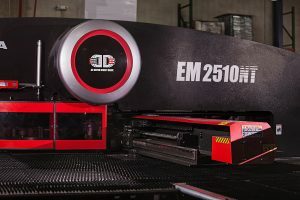 To keep up with demand, Moreng Metal Products has added a new AMADA punch press to expand their sheet metal department. The EM 2510NT Punch Press will give Moreng Metal Products added capacity & the ability to run jobs “Lights out 24/7” by utilizing it’s automatic sheet loader & unloader. This requires no manual intervention while parts are automatically feed to the turret & stacked post punch. Besides the time saved by eliminating part “shake-out”, this 45 station machine produces 500 HPM (Hits Per Minute), with punching accuracy of ± 0.1 (Mild mode ± 0.07). Contact us today @ info@morengmetal.com to learn how your product would be produced using our Brand New Amada EM 2510NT Punch Press!